Tom Hardy is one of the biggest, most well known actors in the world today. He has also had one of the weirdest careers of any actor that I can remember and that’s why I did some research and decided to write this piece. We will look at his movie career and then break down his roles into a few categories to get a good look at his role types so far. Looking through Hardy’s IMDB page the first thing that popped out at me was that he appeared in a few episodes of Band of Brothers and in the film Black Hawk Down in 2001. In 2006, he was a major role in the BBC TV movie adaptation of Sweeney Todd until he broke into Hollywood when he appeared in Christopher Nolan’s blockbuster film, Inception. After his role in Inception, Hardy really rips through Hollywood and becomes the star we know today. In 2011, he had a part in Tinker Tailor Solider Spy and got a leading role in Warrior. 2012 was a monster year for Hardy, he starred alongside Chris Pine and Reese Witherspoon in This Means War, he worked with Shia LaBeouf in Lawless, and closed out the year starring as Bane in The Dark Knight Rises. In 2013, he appeared in the movie Locke, in this movie he is the only character that is ever seen on screen. Hardy worked with the legendary James Gandolfini in The Drop in 2014 and then did three more films in 2015: Mad Max: Fury Road, Legend where Hardy played both main roles, and finally The Revenant. In 2017, he worked with Nolan again in Dunkirk and his most recent film is Venom. Hardy has also had two major TV roles, Peaky Blinders from 2014-2017 and Taboo in 2017. 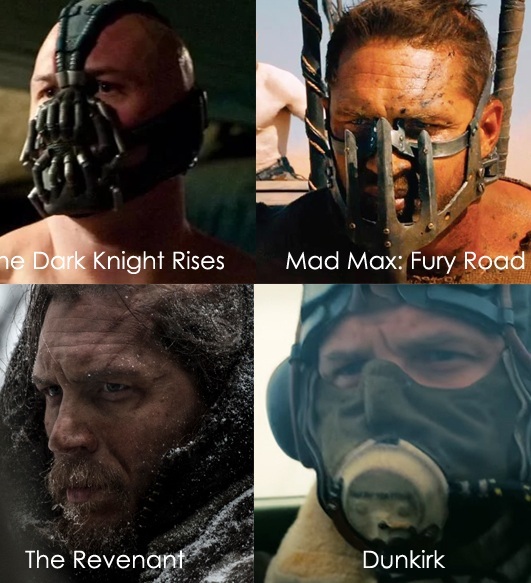 Is Tom Hardy the most interesting actor in Hollywood right now? The diversity of his roles leads me to say yes. In one movie the guy played two brothers, in another movie he played a bootlegger with a crazy accent in Depression-Era Virginia, and in another he was the only person on screen for an hour and a half. Most interesting? Possibly. One thing I do know is the man loves wearing masks.